Hi! Happy New Year 2017!!! This is my first post in the new year and let's see how to create simple ajax pagination in php pdo, mysql and jquery. Pagination script adds on for user experience by allowing users to skim through data across multiple pages instead of endless scrolling. 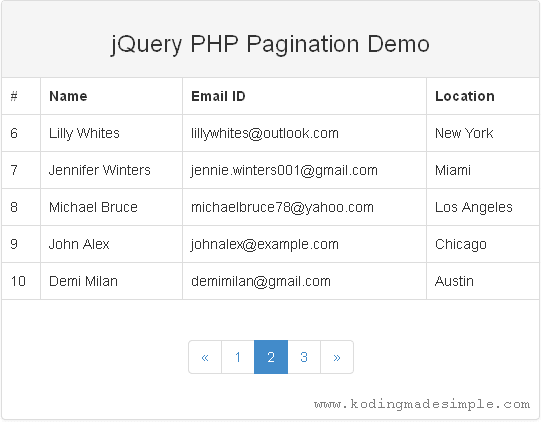 But while implementing pagination in php certain things has to be taken care of. For the matter, the process may get complicated with too many lines of code when not using external libraries or plugins. And refreshing the page every time user clicks on a page link is not going to look pleasant. You'll definitely need to be using AJAX. So to simplify the process I'm going to use a jQuery plugin called Bootpag which is light-weight and handles ajax request at the background effortlessly. The plug-in rely on bootstrap framework. Below I have shared a simple php pagination script. It fetch and display mysql record in a html table and split the records over multiple pages with pagination links at the bottom for navigation. Here are the sql commands to create required database and table. Run them in mysql interface to create db & table. First make sure you have all the below library files in place and then move on to coding part. This is the database configuration file. Here's where you define connection details to mysql and more importantly the number of records visible per page. Also I have used PDO library instead of mysqli to connect php to mysql database. The variable $row_limit defines number of records to be displayed per page. Just change this limit according to your need. It is the main file to show records from mysql db as html table along with pagination links at the bottom. The database records are split into several pages and displayed one page at a time. In order to generate pagination links we need to calculate the number of pages. You have to just divide the total number of records by rows per page. Do you notice that we haven't used any ajax() function in our script? Here's where the bootpag plugin comes into play. It takes care of ajax call at the background. All you have to do is, use the plugin's load() method to load the page results and bootpag() method to display pagination links and the rest of the things will be taken care automatically. This script will be executed during ajax request. It pulls of the records from the database by using LIMIT Query and returns only a small set of rows to be displayed on a particular page. "<td>" . $row['id'] . "</td>" . "<td>" . $row['name'] . "</td>" . "<td>" . $row['email'] . "</td>" . "<td>" . $row['city'] . "</td>" . That's it! Now we have the complete set of coding for ajax driven pagination using php & mysql. Run index.php and you can see the records displayed on html table with pagination links. Initially it will show you the results for the first page and you have to click on the page links to navigate to other pages. 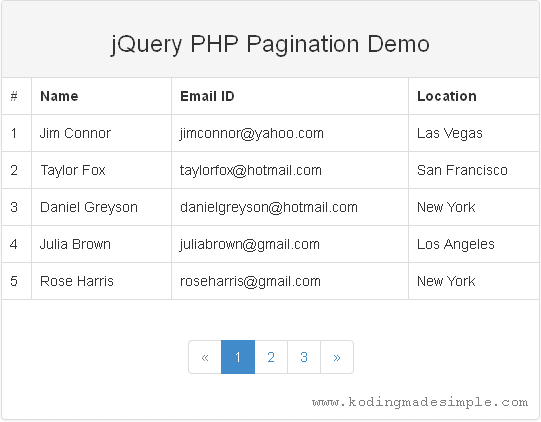 I hope you find this simple ajax pagination script with jquery, php pdo & mysql useful. The code is highly customizable and you have all the required things in place. If you have any queries then please let me know through comments. My comment previous is incorrect. The pagination really display only total registers/row_limit.